As leaders of the 20 richest nations prepare to meet in the Turkish resort of Antalya, there are alarming indicators about the health of some emerging economies — including Turkey, where inflation is high and the currency struggling. But it is Russia that is suffering the most, said Andrew Kenningham of London consultancy Capital Economics. 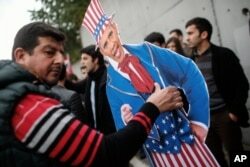 Plainclothes police officers take away an effigy of President Barack Obama as members of the Turkey Youth Union gather to protest the upcoming visit of Obama to Turkey in mid-November for G20 summit in Antalya, outside the US consulate in Istanbul, Nov. 8, 2015. 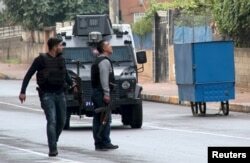 FILE - Turkish police special forces take part in a security operation in Diyarbakir, Turkey, October 26, 2015, where two Turkish policemen and seven Islamic State militants were killed after police raided more than a dozen houses in the region. “Terrorism in the Middle East, primarily, and the Syrian refugee crisis — they're going to be dealt with by the leaders at the dinner, where they meet alone and can deal in a more flexible fashion,” he told VOA via Skype from Antalya.